UK, 1947, 139 minutes, Black and white. Vivien Leigh, Kieron Moore, Ralph Richardson, Marie Lohr, Sally Ann Howes, Niall Mac Ginnis, Michael Gough, Helen Haye, Mary Kerridge. 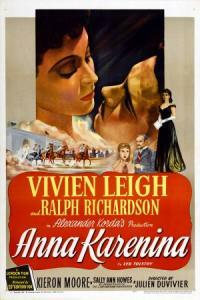 Anna Karenina is a British version of Tolstoy's classic. Made with Greta Garbo as Love and then as Anna Karenina in the '30s, it was also remade as a lavish telemovie with Jacqueline Bisset in the '80s. This version is a showcase for Vivien Leigh. Ralph Richardson is Karenin and Kieron Moore is Vronsky. There is a good British supporting cast. The black and white photography and evocation of Russia in the 19th. century is good. Direction is by French director Julien Duvivier who had made Tales of Manhattan, Flesh and Fantasy and Lydia in the U.S. during World War Two. While the film captures the essence of the novel, critics consider the Garbo version (though not as accurate) as more lively cinema. The remake, with Its more ample running time, stays closer to the original novel. 1. Tolstoy's classic story? Its status in the 19th. century and 20th century? In literature? Portrait of human nature? This film's place in the cinema tradition? 2. British production: black and white photography, decor, costumes, atmosphere? Light and darkness, shadows? Editing and pace? The musical score? 3. The stars and their presence, credibility? 4. Audience response to the tragic story of Anna: her character, audience sympathy and understanding, the motif of the train, her earnestness, love, fall, change, death? A symbol of marriage fidelity and infidelity? Karenin as rigid? Vronsky as dashing? 5. The situation of Russia in the 19th. century: aristocratic society, czarist regime, elegance, fashion, moral expectations, the law? Individuals victimised by expectations and the law? 6. The portrait of Anna: in herself, her relationship with Karenin, the background to the marriage, love and lovelessness, the importance of her son? The importance of her mission to Moscow, her concern for her brother, Dolly? Kitty and the encounter with Vronsky? Vronsky's family? Vronsky's pursuit of her? The ball, her reaction? Vronsky following her back? The separation from Karenin, living with Vronsky, the lie? Pregnancy? The change? The attitude of her family? Karenin's severity? The love for her son, the condition for the divorce? The build-up to her depression, her decision to kill herself? 7. Karenin and his coldness, love for his wife, age, his devotion to his work, bureaucracy? His support of Anna, discovering the truth? Harshness? Revenge? His covering up against public scrutiny? The clashes with Vronsky? The conditions for divorce? Anna wanting to visit her son? His bitterness? 8. Vronsky as a dashing type, military, society, infatuation with Anna, pursuit of her, seduction, success, coping with Anna's depression? His own career? The impact of her death? 9. The background of Anna's brother and Dolly, Kitty and Levin, the marriage, broken marriages, fidelity? 10. The supporting cast: the maids, the nurse, the servants? 11. Anna and her relationship to her son? Her daughter? 12. Audience familiarity with the basic plot? Tolstoy's power of characterisation and situation? Insight? A universal story?